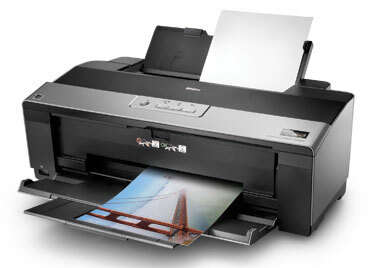 The Epson Stylus Photo R1900 is a large-format photo printer capable of delivering wide, high-definition prints across several media types and sizes, with features consistent with the other models in the Stylus Photo line. The printer measures 24.3" by 31.4" by 16.3" with all trays extended (which must be open for the printer to be able to print) and 24.3" by 12.7" by 8.4" when all trays are closed. The printer weighs 26.9 lbs, making it easily transported if necessary and able to fit comfortably on a desk with other conputer equipment, though the NX-series printers are more compact and weigh half as much, making them worth considering if you are particularly pressed for space. The R1900 prints at a maximum resolution of 5760 by 1440, consistent with other high-resolution inkjet printers. It produces photos at speeds as quickly as 44 seconds for 5" by 7" photos, 72 seconds for 8" by 10" photos, and 1 minute, 32 seconds for 11" by 14" photos. The R1900 can print to very large documents at a maximum size of 13" by 44" without borders. It can print to paper sized 4" by 6", 5" by 7", 8" by 10", A4, letter, legal, 11" by 14", 12" by 12", B, A3, and super B, as well as 8.3" and 13" wide panoramic roll paper. It can print to borderless documents across almost all of those sizes, but not to legal or Super B-sized paper. The R1900 has a paper input tray capable of holding 120 sheets of plain paper and 30 sheets of photo paper, as well as manual-input trays capable of holding 1 sheet of fine art paper or 1 CD or DVD (to which it can print directly). The R1900 includes two USB 2.0 ports for connectivity but lacks a number of features, such as a memory card reader, wired networking support, wireless networking support, and PictBridge support, which enables users to connect digital cameras directly to the printer, bypassing the process of sending the job from the camera to the computer to the printer. While these may not be major issues, they are all features offered by other Epson printers, potentially making the Photo R1900 an inferior choice to other models. To network the R1900, you will need to connect it to either an external third-party print server or share it across a network, requiring the system it's connected to to be on whenever it's needed to print documents. Many users, as consistent with Epson products, complain about the printer's ink cartridge replacement system, which prompts it to "charge" all cartridges upon replacement of one, draining them of 8-10% of their ink. 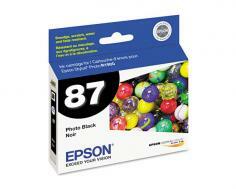 Furthermore, users complain that the unit refuses to recognize cartridges due to Epson's cartridge replacement technology, requiring that defective cartridges be shipped back and replaced by Epson. Cleaning the print heads also drains ink, and when one color cartridge is empty, the print will shut down totally, refusing to print any documents until that cartridge has been replaced. A USB cable is not included with the Stylus R1900, requiring the additional purchase of one, and a print manual is not available. There are no options for PC-free printing as there are across other, less expensive Epson models. Review it: "Epson Stylus Photo R1900 "
The Stylus R1900 ships with eight full cartridges, all of which are rated at different yields and levels of consumption and will need replacement at no consistent cycle. The matte black cartridge is rated at a yield of approximately 520 pages. Color is split between cyan, magenta, yellow, red and orange cartridges all rated at about 915 pages. The printer's photo black cartridge is rated at approximately 5630 pages and the gloss optimizer cartridge, designed to improve the quality of glossy prints (for which this printer is intended), is rated at approximately 3615 pages. However, large, high-resolution glossy prints will drain the printer much faster than these listed page ratings.